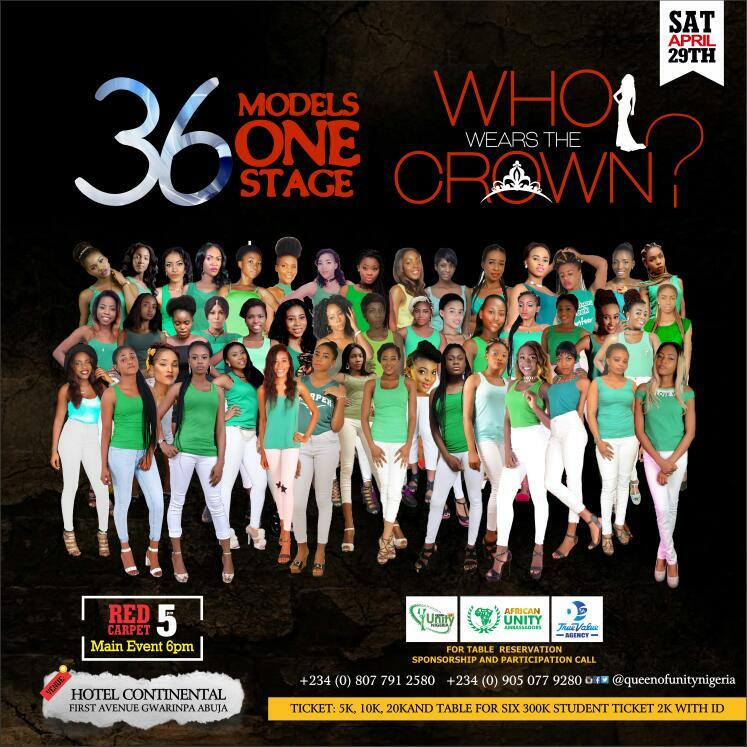 36 models,1 big stage:Queen of Unity Nig world Set to hold grand finale in Abuja. QUEEN OF UNITY World/African unity Ambassador Award. The 2017 edition will be featuring 36 contestants representing the 36 states in Nigeria and it will also stage the biggest Award show; African Unity Awards honouring individuals and organizations that have supported one way or the other to uphold unity and peace in Africa at large. Amb wahala, Stainless, Shortcut, mc cynthia God’s Pikin, Koboko Master, Chuks D General, Dr. Ayuba, Ghana Must Go, Mc BOB, Mc mikilaf ,washington, Mr. Odey, MC KLAWN,Mc favour, Mc Jubilee and Mc Philip. Tin Tall Tony (BBN housemate 2017),Efe in bbnaija. Have you read it? 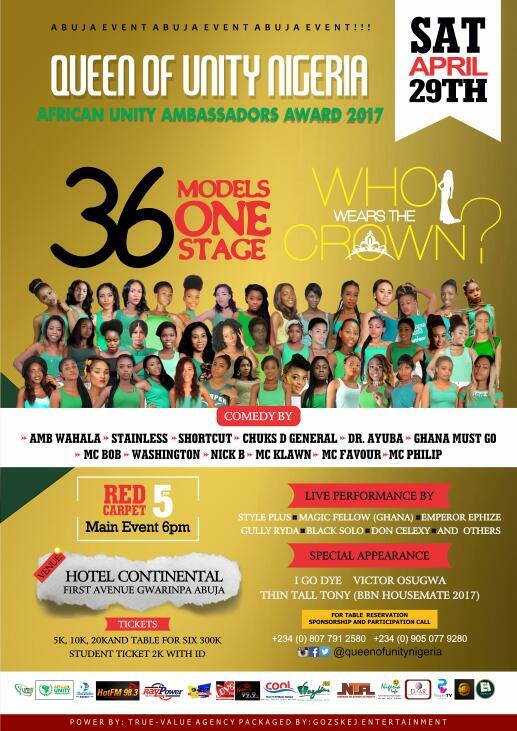 : Meet Queen Blessing Utanung Michael ,Miss Christian Ambassador Nigeria 2016. Supported By:COCACOLA, African Unity Ambassadors, Zodiac Pub & Resort, ABPFEON, DSTV, NTA, AIT, Aso Radio, IMC Media, Hotel Interconnect, Ehol global, Newsland, Sammy Innovations, Alex report,Barcity media,exclusive Don records, Soultide Magazine, Fame Teeve, La Villa Afrique Entertainment,Modelssphere, Gt9aj Blog, Rihanna fashion house, de bliss model,MGB,steller entertainment. The only hard working queen in this pageant is just this Simi or what's that her name. Others are just lazy.